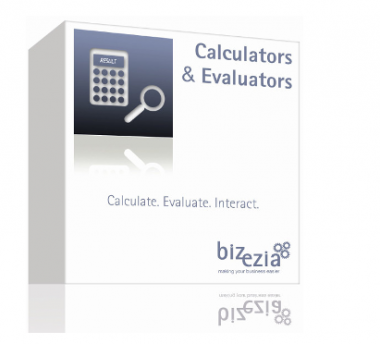 Calculators & Evaluators is an interactive suite of online calculators and questionnaires provided by Bizezia. Calculators & Evaluators is designed to generate fee-earning opportunities through your website. It is the most comprehensive suite available today, with calculators on subjects as diverse as business, law, finance and taxation, and questionnaires on areas such as body language, interpersonal and entrepreneurial skills. These online Calculators & Evaluators will not only attract visitors to your site, but will make them stay longer and create a better perception of your business. You have a choice of 50+ online Calculators & Evaluators which are divided into Calculators (finance based) and Evaluators (questionnaire based). The addition of interactive features creates real fee-earning opportunities with the use of unique Lead-Generation Technology. Below are a list of Bizezia’s Evaluators that we are showcasing on One Smart Place for you to try. If you like what you see, go to Bizezia’s website to learn more about Calculators and Evaluators, including subscription cost. Do you need an Employee Satisfaction Survey?